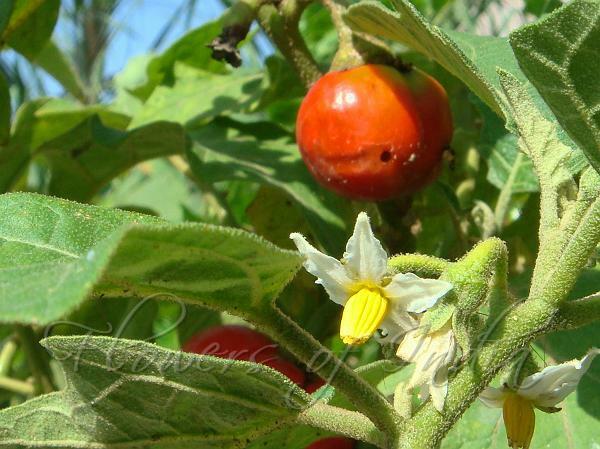 Bitter Tomato is a perennial herb growing up to 70 cm tall, velvet-hairy with stalked or stalkless, 5-9-rayed star-shaped hairs. Stem and branches are prickly; prickles 2-5 mm, 1-2 mm broad at base, straight or slightly curved. Upper leaves are often unequal paired; leaf-stalk 2-7 cm; leaf blade ovate to oblong-ovate, 10-20 x 6-14 cm, with mixed simple and many-rayed hairs below, veins often with subulate prickles 3-7 mm, irregularly sinuate-parted, tip tapering or blunt. Flowers are borne in few flowered, racemose clusters. Flower-cluster-stalk is 1-1.5 cm. Flowers are 5-merous. Flower-stalk is 5-12 mm, with prickles 0.2-2 mm. Calyx is bell-shaped; sepals slightly unequal, ovate to ovate-lanceshaped, 5-7 × 3-4 mm. Flower are white or slightly purplish, star-shaped or star-shaped-rotate, 1.5-2.5 cm in diam. ; limb about 6.5 mm. Filaments are 0.5-1 mm, hairless; anthers lanceshaped-elliptic, 4-5 × 0.7-1 mm, notched at tip and base. Ovary 4-8-locular. Style 5.7-7.5 mm. Fruit is orange or red, 1.5-3 cm in diameter, superficially resembling a tomato, often longitudinally 4-6-grooved. Seeds are kidney-shaped, 2-3.5 mm in diameter. It is a popular vegetable in north-east India. 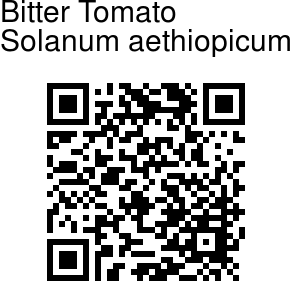 Bitter Tomato is probably native to Africa, cultivated in NE India. Medicinal uses: Medicinal applications include the use of roots and fruits as a carminative [dispelling gas from flatulence] and sedative, and to treat colic and high blood pressure; leaf juice as a sedative to treat uterine complaints; an alcoholic extract of leaves as a sedative, anti-emetic [nausea or vomiting] and to treat tetanus after abortion; and crushed and macerated fruits as an enema.